magine you're riding down the silly-fun Doctor Park descent, full of confidence, moving faster than ever before, a huge grin on your face. Because you're rocketing so fast you don't actually see the wrapper, or the Clif name. The litter is only visible as a silvery flash of reflected sun as you pass by. Nevertheless your mind registers something that doesn't belong out in the woods and you must make a decision: keep riding or stop, go back, pick up the trash and continue your ride. The consequence of your decision is what we call trail karma. Imagine you are pedaling up Cement Creek towards your favorite after-work ride. A couple of guys sit on the side of the road with an upside-down bike. You stop and ask if they've got things under control. One replies, "We were heading for the XYZ Trail (the same one you plan to ride) when my tire sidewall got slashed. I fixed the tube but it's kinda coming out of the tire so we're going to head home before the tire ruptures completely." Your decision here affects your trail karma. What do you do? 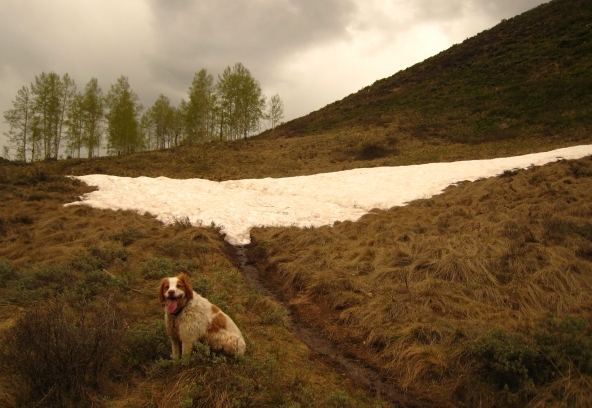 Imagine you're crossing Walrod Cutoff with your dog and run into a snow field and section of muddy trail. What path do you take? e all know about trail ettiquette, the common-sense rules about who has the right of way, how to navigate a muddy or snowy trail, etc. Trail karma is not a rule. Trail karma is a state of mind, a morality of sorts. 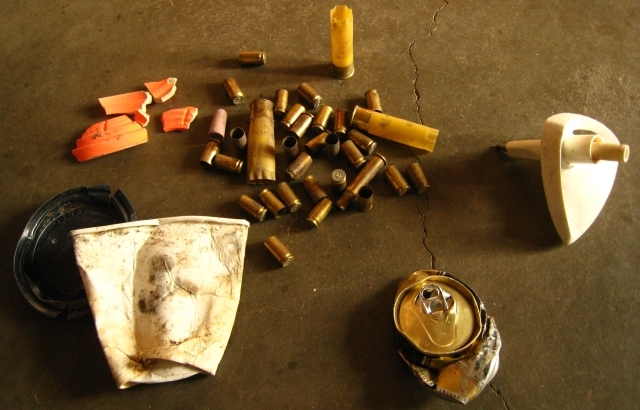 Pick up some litter and your good trail karma increases. Help a total stranger and your trail karma goes up. Repair a section of avalanche-damaged trail. Stop to give someone directions. Turn back instead of riding a long section of muddy trail that you know will be damaged if you ride through. These actions require effort, a shift in momentum, perhaps even a change in your planned outing. Our view is the harder it is to stop and make the effort the more you'll benefit in the long run. Likewise, the more trash you drop, the more damage you incur, the less assistance you offer, the more your trail karma goes down. And it seems to go down much faster than up. In most situations you can either help, do nothing, or do harm. Helping is obviously good, and doing nothing, while lame, is at least not harming anything (usually). But negative actions like littering or braiding the trail bring your trail karma down fast. If you are one of the jerks who left this trash up Walrod Gulch this winter you better be careful 'cuz your trail karma is in the toilet. 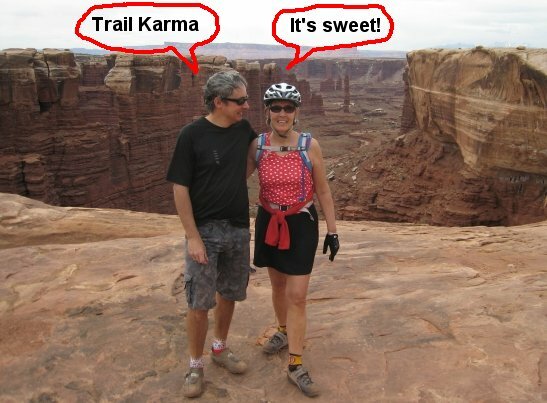 The benefits of trail karma are not immediately tangible. You can't see it or hold it. You can't really brag about your trail karma "high score" to your friends. Yet you still know it's there. A positive trail karma yields confidence and peace of mind. When you clean an especially challenging section that often beats you, perhaps your trail karma kicked in. If you fall down a steep sidehill and only receive a small scratch, thank yourself for keeping your trail karma balance positive. o think about your own trail karma. Helping out, cleaning up, and doing the right thing really feels good. Who knows? Next time it might be you who benefits from a stranger taking time to stop and ask a question. Maybe it will be you whose ride is saved by that stranger offering of a piece of duct tape to repair your torn sidewall. Maybe it's you who experiences a beautifully pristine back country hike free of trail trash because someone else paused on their fun descent to pick up a wrapper. Trail Karma. It works. Tell your friends.